Designing a small bathroom can be daunting task if you have no idea on what to do, where to start and how things should be done. It can also be tricky and somewhat stressful if you won’t arm yourself with the right tools, equipment, skills and knowledge needed for the job. Planning and preparation is a key for a successful small bathroom design. Aside from that, you will also need to apply some of these proven effective tips and tricks that can surely help with the redesigning and remodeling tasks. They will not only make your small bathroom look bigger and better, they can also help it become more space-efficient. Bathroom corners can provide extra inches of floor space so better use it wisely and creatively. It’s a good area to install a floating shelf, add extra storage unit or even install a small sink. You can also use it to add vibrant designs, unique accessories and relaxing colors that can improve bathroom aesthetics. Upgrade or replace your toilet with a newer, compact elongated model. Aside from providing more comfort, new toilet models are environment friendly as they use less water. The size of it is also quite fitting for small space bathrooms. Choose lighter tones of colors. Light colors can make a small space feel more spacious and airy. Avoid busy patterns at all cost as it can overpower and shrink the whole space. You can use black and white tiles at the flooring and use light colored paint or design at your ceiling and walls. You can also add some textures rather than patterns to add some sort of character into your chosen bathroom colors. There are lots of new and stylish faucets that are truly space-savers. They don’t look big or bulky unlike the older designs and models. They are also proven to be more efficient in terms of conserving water. Sliding doors doesn’t take up a lot of space so if your shower doesn’t use one, consider replacing it. The clear glass of sliding doors can create the perception of larger space. If this is not applicable at your bathroom for some reason, a shower curtain is always available. Mirrors reflect light and can create an illusion of a bigger space. 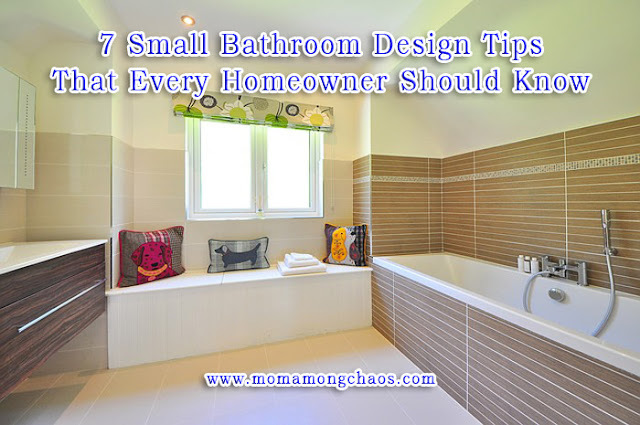 It can make a small bathroom appear much larger than it is. Consider installing one above the sink and another one at your bathroom wall. If your tub is old, quite sure it eats a lot of space in your bathroom. There are new smaller models of tub that are good enough to give you a perfect bath while decreasing the amount of space it eats up. These tips and tricks can surely help make your small bathroom appear larger and become more efficient than it used to be. Try them out and see the positive change it can bring. Ron is the webmaster of Apartments-For-Rent-In-Michigan.Com. He often writes tips and advice for homeowners, tenants and landlords. You can visit this blog for more information.